Keep'em all on the right track with high efficiency bicycle storage that maximizes physical space while providing access to all bicycles. The 8' Track Rack features sliding trolley hanger arms with hooks that range in sizes from 5.5" to 20.5", which allows for easy loading and unloading of bicycles. 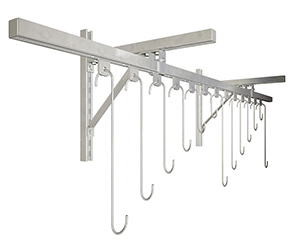 The all-steel construction of the ground, wall or ceiling mount Track Rack creates efficient, storage for up to 13 bicycles per rack. If the bicycle surplus is growing, the Track Rack offers convenient 8' add-on sections to help maintain neat and orderly bicycle storage.